You’ve connected to data, created some views, placed them on a dashboard, and now it’s time to share. Before you do, have you considered who you are sharing your dashboard with? Is she using her phone on the go? Maybe she’s more of a tablet-on-the-couch kind of a person. Or, most likely, she’ll want to ask questions with your dashboard on any device, at any time. After all, it’s the data that matters. Before diving in, consider your end user’s needs. Dashboards can answer many questions and allow for further exploration, so take a moment to guarantee that your viz is digestible. Imagine you need to report sales trends by quarter to your boss. Your default dashboard (the first one you make) might include two views: a bar chart called Sales Trend by Quarter, and a line graph called Accumulated Sales by Week of the Quarter. Objectively, the second view helps contextualize today’s sales trends. But put yourself in your boss’s shoes: That line graph might not be necessary on her phone, when she’s really just looking for trends on the go—one bar chart, in and out. With device designer, you can get rid of the redundant view on phones specifically, and you’ve got space for the bar chart your boss really wants. Tableau makes it easy to optimize dashboards for viewing on any device. Check out these tips and tricks for using device designer (new in Tableau 10!) to let your data shine on phone, tablet, and more. In many cases, your dashboard will automatically look and feel great across devices. Click "device preview" to see whether this is the case for you. The grey bounding box gives you a good idea of how your dashboard will appear on the selected device (Device type). Your dashboard content doesn’t fit naturally on small screen sizes. There are many objects on your dashboard. You’re picky and have heightened design sensibilities. For small tablet or phone screens, limit the number of objects on your dashboard to just those you really need. Ask yourself: What is the essential information I want to convey? Begin by removing unnecessary views, filters, titles, and legends. Then replace spacious filters, like "single value (list)," with more compact ones, like "single value (dropdown)." This saves precious screen space for your data! With optimized content, it will be easier to give your dashboard a small-screen facelift. You’ve considered your audience, and you’ve optimized your dashboard’s content. What next? Take advantage of size controls. Device designer includes three sizing options: Default, fit all, and fit width. Selecting "fit all" automatically fits dashboard objects to the height and width of the device. If you need to include many views for small tablet or phone screens, "fit width" is a better option. It allows the user to scroll vertically to view multiple dashboard objects—automatically fitting them to the device width and a set height. 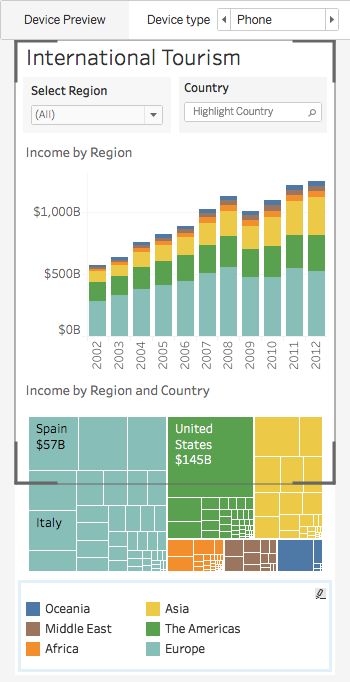 Pro tip: Check the “Tableau Mobile app” box to size your dashboard for optimal viewing in Tableau Mobile. Use a “peek” to indicate when more content is available by scrolling. If you create a scrollable dashboard, indicate to your user that there is more content below the fold. The best way to do this is with a “peek," content that disappears off the bottom of your dashboard. Bonus: Pin maps and turn off pan and zoom. 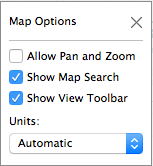 For scrollable dashboards with map views, pin your map, and disable pan and zoom. This prevents accidental map interactions while navigating on tablet or phone. 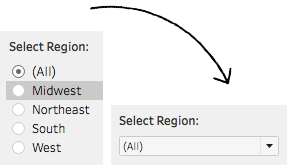 In Tableau, select Map > Map Options to open this dialog. Ask yourself: What key information does my end user need from my dashboard? Click "device preview" to confirm how your dashboard looks across different devices. (For small screens) Remove unnecessary views, filters, titles, and legends. (On touch devices) On scrollable dashboards, pin your maps, and disable pan and zoom. With device designer, you’ll rest assured knowing your data stands out with optimized dashboards on any device! For an in-depth look, watch Device Designer. You can also check out the following Online Help guides: Dashboards and Try It: Create Dashboard Device Layouts. "If so, stack dashboard objects and use a “peek.”" - How to enable peek?